Up-and-coming Scottish electro-pop band CHVRCHES, which released its studio album “The Bones of What You Believe” Sept. 23, played a killer show Sept, 18 at Union Transfer. Photo Courtesy Henry Laurisch. 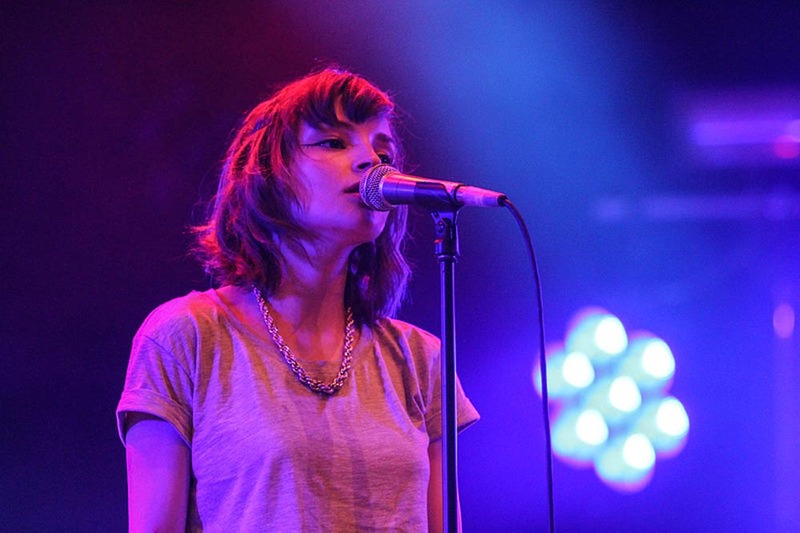 Lauren Mayberry (pictured) is the lead singer of CHVRCHES, an emerging Scottish electro-pop group. She is accompanied by Iain Cook on guitar and Martin Doherty on synthesizers and samplers. The trio played at Union Transfer Sept. 23. The group from Glasgow, Scotland, formed in 2011 and consists of the adorably charming 25-year-old lead vocalist Lauren Mayberry, guitarist Iain Cook, and the man on synthesizers and samplers, Martin Doherty. The doors opened at about 8 p.m., emanating a sense of hype and excitement that quickly spread into the room as everyone waited to see these frequently talked-about artists. Opening for CHVRCHES was XXYYXX, also known as the witty and smooth 17-year-old Marcel Everett. It took the crowd a while to start to feel the vibe that XXYYXX was putting out; his music can be described as a new experimental lo-fi style. “Lo-fi” describes audio recordings of a lower quality than the typical standard of music and is produced either by lessening the quality of the recordings or by using specialized equipment. However, once Everett hit the crowd with the first heavy drop of the bass, everyone was bobbing their heads and taking in the ethereal dancing of the performer, who seemed to be enjoying himself even more than the crowd. Once XXYYXX’s set was over, most of the vibrant crowd seemed tranquil while waiting for CHVRCHES to start a show that would meet and transcend the hype. In spite of the minimal setup for the trio, the lights, effects and stage presence of the band were all so impressive that it was hard to look away. Mayberry shared adorable remarks and stories between songs, including an explanation of the tea that she drinks and keeps onstage in a water bottle. Doherty, who stayed behind his synthesizers for most of the show, switched places with Mayberry at one point and sang an original song with the band. The whole set was a pleasant surprise, sounding better performed live than on the pre-released album. Ending the show with their hit single “The Mother We Share,” the trio did not disappoint, leaving many fans excited to hear what’s next for CHVRCHES.